In which Old Spicer is pitted against the underbelly of New England crime. The 12th of April, 189— , as Old Broadbrim, the famous Quaker detective, will ever remember, fell on a Thursday. Just after the noon hour on that day he received a letter asking him to come to one of the most elegant private residences on Fifth Avenue. He was sure no crime had been committed, and he was puzzled to guess just what the invitation meant. The owner of the mansion was Custer Kipp, one of the richest and best-known dwellers on the avenue, a man who counted his wealth almost by the tens of millions, so it was said at least, and the detective had seen him often on the street and in his elegant turnout in the parks. Old Broadbrim answered the letter in person, as was his wont. He reached the door of the mansion, and his ring was answered immediately, as if he was expected, and a servant conducted him into the library. In an armchair at the mahogany desk sat the millionaire. Custer Kipp was a man of sixty-three, a tall, slim, but handsome, person, and withal a person who was approachable to a fault. He was a widower at the time, and his only child was a son named Foster. 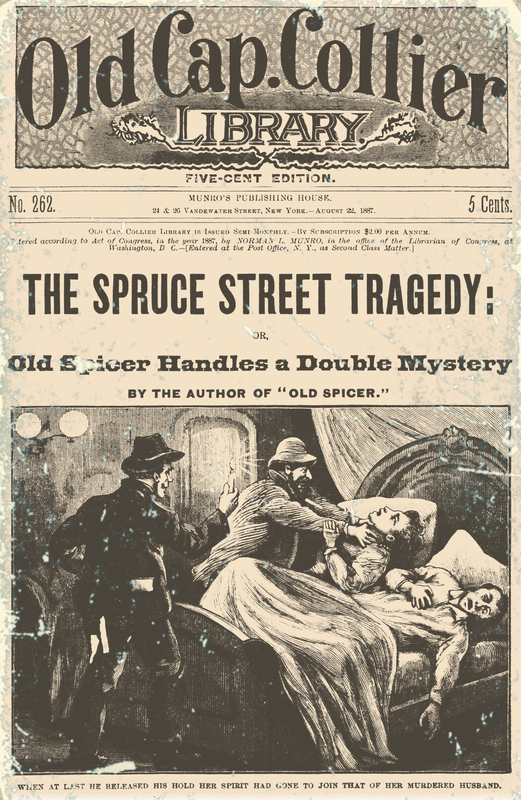 This young man was not in at the time of the detective’s call, and the only other person in the house who belonged to the household was the nabob’s ward, Miss Nora Doon, a young lady just quitting her teens and the pet of the mansion. Custer Kipp smiled drearily when the figure of the Quaker crossed the threshold, and invited him to a seat near the desk. Old Broadbrim bowed and waited. “You do not want me to wait, I see,” said Old Broadbrim. “It’s a strange commission,” replied the detective. Old Broadbrim did not speak. Already the traditional woman had entered the case. The detective sat silent and rigid for a few seconds. Never before had a proposition of that sort been made to him. It would take him from cases that might spring up to demand his attention. After all, the man before him might have no enemy at all, and the time spent in watching him might prove lost time, though twenty-five thousand dollars would be his at the end of the year. “It binds one rather close,” said Old Broadbrim. Custer Kipp leaned forward and opened the desk. Running his hand into it, he pulled out a package and untied it before the detective’s eyes. It was a novel and romantic engagement and appealed strongly to the detective’s curiosity. Old Broadbrim, a man of brevity, picked up his hat. “I will be here,” he said. “Thee can trust me,” using, as he did at times, the Quaker formula. In another moment he had turned his back on the millionaire and was walking toward the hall. At the door he glanced over his shoulder and saw the figure of Custer Kipp bent over the desk, and the face was buried in the arms. Old Broadbrim closed the door and went away. Down in his office, in the room in which he had thought out more than one tangle of crime, he threw himself into his armchair and took up a cigar. The day deepened, and the shadows of night fell over the city. Old Broadbrim came forth, and walked a few squares after which he turned suddenly and rapped at a door belonging to a small house in a quiet district. The portal was opened by a man not very young, but wiry and keen-eyed. The detective’s countenance seemed to drop. He began to see how foolish he had been to make a bargain with Custer Kipp. “What is it, Clippers?” he asked. Old Broadbrim said he would at once take a look at the mystery, and Clippers, his friend, offered to conduct him to the scene of the tragedy. The two entered a little house near the mouth of an alley, and Clippers led the way to a room to the left of the hall. At this moment the pair entered the room and the hand of Clippers pointed to a couch against the wall. Old Broadbrim stepped nimbly forward and bent over the bed. A rigid figure lay upon it, and the first glance told him that death had been busy there. “Who is he?” asked the detective. The other fell back with a cry of amazement. “Well, I’m stumped!” cried Clippers. Half an hour later the two detectives named Hargraves and Irwin knew all there was to know at the time of the death of Jason Marrow. It was not much, for the slayer had done his work with great secrecy and had left no clews behind. The matter was destined to become a mystery to the department, a deep puzzle to the best men on the force for months. Old Broadbrim went back to his room after the find in the house near the mouth of the alley. For long into the night there was a light in the detective’s room, and he might have been found at the table at work. It was near midnight when a footstep came to the door and stopped there. Old Broadbrim heard the noise and waited for the rap. When it sounded he crossed the room and opened the door. A young man with a very white face and a figure that trembled a little stepped forward. “To look at whom?” asked the detective. The detective started violently and looked at the man in his chair. “Is it murder?” he asked. The young man arose and hastened from the room. Old Broadbrim soon appeared at the Kipp door and was admitted. He found the parlor well filled with strange people, for the most part neighbors in the upper circles of city life, but here and there was a representative of the lower classes who had edged their way into the mansion. The moment the detective crossed the threshold he was approached by a young girl, with clear blue eyes and a good carriage, who instantly addressed him. The detective was conducted from the parlor and the nabob’s ward opened the door of the library. In another instant she had closed it and they stood in the large chamber, elegantly furnished, and containing rows of books magnificently bound, for Custer Kipp had spared no pains with his tastes. The detective stepped forward, and the hand of Nora Doon turned the gas a little higher. Custer Kipp was leaning back in the chair with his white face turned toward the ceiling. The arms hung downward as if they had slipped over the sides of the seat, and the face showed traces of the death agony. “I heard but little,” said Nora, while the detective looked at the dead. “I go upstairs early when I am not at the opera or elsewhere. I remained at home to-night for I had letters to write, and he came home from a ride about seven. “I heard him in the library bustling about for an hour while I read in my room, and when everywhere silence seemed to come down over the house. When I arose to retire I thought I would look downstairs, as is my wont, and see if all was snug. As I came down the stairs I peeped over the transom of the library, as one can do from the head of the flight, and to my horror I saw him in the position you see him now. “There was something so unnatural in the pose, something suggestive of sickness if not death — for I must own that the thought of sudden death interposed itself — that I bounded to the foot of the stair and opened the door, which was not locked. She ceased and glanced at the man in the chair, while a shadow of fear and inward dread seemed to take possession of her soul. The servant had entered the room and stood near the door with his eyes riveted upon the young girl. When she spoke his name he came forward and extended his hand. Nora took the find and glanced at it, then handed it to the Quaker man-hunter. Old Broadbrim looked at it, going over to the desk where the droplight swung. Old Broadbrim looked up at Nora as Simpson left the room, and his look drew her toward him. “Is it anything?” she asked. The detective still held the bit of paper in his hand. “Did Mr. Kipp ever have any correspondents in Australia?” he asked. Nora shook her head, but the next instant she lost some color. And the hand of Nora Doon pointed at the paper in the detective’s hand. Old Broadbrim extended the paper, and the girl took it eagerly, but with some show of fear. He watched her as she leaned forward and looked at the writing in the light of the dropjet. Suddenly the young lady uttered a cry, and then turned upon the man-hunter with a frightened face absolutely colorless. Old Broadbrim took the paper and put it away. “Not a word about this, please,” he said to the girl. In after days Old Broadbrim, the tracker, was to recall his words with many a thrill.